Designed to go anyplace, indoors or out. From the top a 15,000 ft mountain to a 55° C desert or a -30° C snow field. 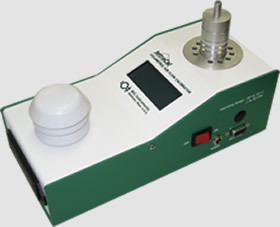 Our primary element Venturi calibrators will operate for 20 continuous hours on 4 AA cells. We are pulsation free, accurate to less than 1.0% of the flow rate reading, NIST traceable and designed, built and calibrated in our ISO 9001:2008 facility. We have always built our calibrators to these standards. Our output screens show both Actual and Standard flow rates. The BGI tetraCal® is the first and only volumetric continuous flow calibration/audit device which gives a direct indication of volumetric flow rate, standard flow rate, barometric pressure (both mm/Hg & mb), and ambient temperature in one instrument. It was developed for use with all types of air samplers in the 0.1 to 30 Lpm range using the tetraCal or 1 to 60 Lpm using the tetraCal-Ultra. Typical screens are shown below on the left. 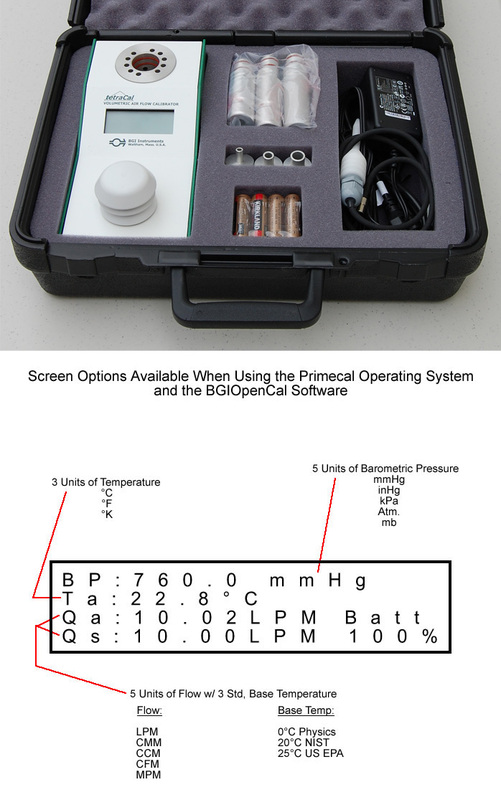 It is the only field audit/calibration device which meets the same temperature criteria as the EPA designated samplers themselves. The temperature range is -30° to 55° C (EPA requires up to 40° C). The heart of the tetraCal® is a venturi which is superior to an orifice in that it offers no sharp edges which can be damaged and a 90% recovery of the measurement pressure drop, important when calibrating some forms of speciation samplers or other critical orifice controlled devices. Because flow through the instrument is uninterupted, our graphic software provides a continuous output display of all functions.